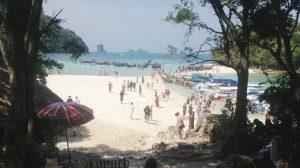 The national park authority at the centre of the protest by boat operators in Ao Nang, Krabi has requested 128 million baht to develop tourism in the area. The request comes from the Hat Nopparat Thara – Moo Koh Phi Phi park authority to the national park office. They said they used to collect 100 million baht a year. But since the fees for tourists went up they collected 500 million baht in revenue last year. They want a proportion of this ploughed back into the area. Boat operators in the area don’t care about this, however. They want the national park HQ to lower the fees by half from 400 to 200 baht for adults and 200 to 100 for foreign children. Thais pay 40 and 20 respectively. They say their business has been hit by 60% as tourists refuse to be fleeced. The local chief Sorayuth Tanthian has requested a transfer citing stress. While central government has promised to look into the matter ahead of further talks locally set for Monday.